Frank Spencer takes on the South West Coast Path! The UTSW was a race I had got very excited about as soon as I heard about it last year. I don’t like to pick favourites, but if forced to choose my top trail for running, I would without question pick the South West Coast Path. Not only is it incredibly beautiful, dramatic and inspiring, but it is also super tough, having lots of vertical ascent and the footing in places is pretty technical. This together with the fact that it passes through many beautiful, sleepy fishing villages makes it just perfect for my needs. I was born and raised in Bideford just off the North Coast of Devon too so it feels more like my trail than anywhere else. I have over the past years, run over a fair proportion of the path but had never run on a single metre of the UTSW. I didn’t have the opportunity to recce so was again running a race ‘blind’. I had read about other peoples recces with people struggling with trail markings, the terrain and a lot of overgrown stinging nettles! The first two points didn’t concern me, but I knew how irritating it is if large sections of trail are immpassable without stinging yourself to death, so I bought myself a pair of Compressport calf guards. I hate wearing tights, so I thought this would have to do. The knees would be my sacrifice to the nettle Gods. I haven’t felt any difference from wearing my Skins compression tights, but who knows, maybe these things could give me an edge! My lead up to the event was simple. 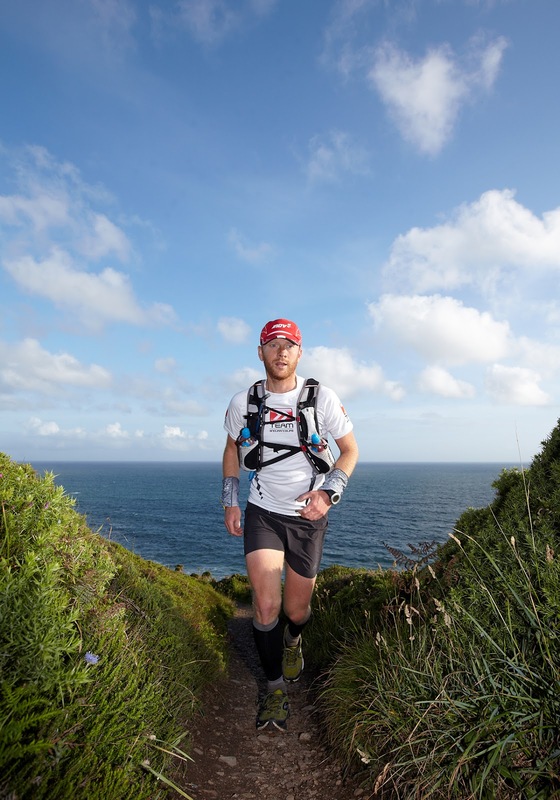 Three weeks previously I had run the Hardmoors 110. The following three weeks were rest days, other than the 30 minute commute I rode twice a day. I felt pretty fresh and hungry for a big run by the time I got to the start line. This race really meant something to me. I was very excited to be a part of the first one and couldn’t wait to get going on the adventure that was sure to unfold before me. It was also the last of my running races I was to run before I begin the Trans-Europe Footrace 8 weeks later. A decent performance was not top of the agenda. Getting round in one piece was the key! The race started at 1900 on the Friday, with the registration being before 1500 at the finish at Watergate Bay in the lovely hotel, so Lou and I drove down first thing in the morning. We arrived with plenty of time so we went and checked into our accommodation a few miles up the road (couldn’t afford the Watergate Bay hotel) at Mawgan Porth, before returning to the hotel to register, listen to the brief and soak up the atmosphere. There were a lot of new faces for me, but slowly and surely I begun to recognise a few. I saw Mark Hines who I recognised from the Hardmoors a few weeks ago. We had a bit of a chat about how we were feeling, what our plans were and the usual pre race stuff. Then I saw James Adams. Lou James and I decided to pop down to the sea front where there was a cafe where we got a meal. Soon enough it was time to return to the hotel for the race brief. After the rather busy and extensive brief, it was time to head down to the race start at Porthleven. The weather was pretty good at the moment though there was some pretty strong winds which would certainly be hitting us hard being on the coast all the time. There had been some record breaking amounts of rain during the week though so I was expecting some wet conditions underfoot. The forecast was for it to be dry till later in the evening the next day. I was estimating my finish time to be somewhere around 24hrs though I really had no clue. If this was correct though, I would miss the rain. One reason to hurry up I thought. I had my pack (my now trusty Salomon 12) down to a pretty decent weight, but I was also carrying a Yellow Brick, which is a GPS tracking device that Endurancelife had given me and four other runners as an experiment. We were the guinea pigs. It was appropriately named, as it was both yellow and brick like in size and shape. It doesn’t weigh too much though so I wasn’t too concerned about it. Lou and I arrived in Porthleven with a fair amount of time to burn so we headed straight for a cafe and got a coffee and a scone. I was buzzing with excitement though felt very relaxed mentally, for the 100 milers seem like a ritual which I am getting more and more used to now. I knew this one would be a toughie, but nothing that would surprise me. After coffee, we wandered back to the car and saw that other runners were arriving now. I started to get ready. I was planning to wear my Saucony Peregrine 2′s but for some reason they have less padding in the heel cup than the originals and rub my right heel badly. I was going to put on a blister patch and wear them anyway, but changed my mind. I own a ridiculous amount of trainers, and I was caught in an unusual situation. I had no shoes to wear! I opened my cupboard that has shoes I don’t wear anymore and had a dig. I came out with two pairs. Brooks Cascadias which are good but really clumpy, and a pair of Inov-8 Roclite 285′s which are fine but don’t have a rock plate which I know I need for the 100 milers. The Roclites went into my drop bag and the Cascadias went on my feet. I met Stu Mills who was down for the 44 mile race the next day and also Dan Doherty who was running and I knew had tremendous speed and was aiming for a sub 20hr run. He certainly had the speed, but I was a little doubtful he could pull it off. All the runners were now gathered at the start on the grass and lots of photos were being taken as we waited for the off. We lined up with me near the front, and we were off. One chap went off like litening while everyone else seemed to be going at a fairly sensible pace. I had gone to the front as I had heard that there was plenty of singletrack in the first section so didn’t want to have to do lots of awkward overtaking. I was running just behind Rob Burnham who I knew had tremendous speed over shorter ultras as he had won the Exmoor ultra in 2011. Dan was behind for a short while before flying past looking very smooth. Never mind, I was here to run as I always run. Against me. It is my way of pacing myself. The gap behind seemed to be stretching out already. Excellent. I was running a little behind Rob, feeling comfortable with the pace. Every now and then he would open up the gap a little then I would naturally close it up. He arrived at the first cp at Marazion just before me. I topped up my bottle grabbed some Clif Shots and left leaving Rob behind. The next section was a few miles along a concrete path into Penzance. I was now slipping into some kind of rhythm after the slightly hectic start. I was passing a few people out for walks and up ahead I could see a couple who had two dogs with them that were both off of their leads. The dogs were play fighting and being very boisterous leaping all over the path. The couple were laughing and saw me coming but made no move to control the dogs. As I went to pass them, one of the dogs leapt back into my path knocking my leg away and I dropped heavily on my left knee. The couple apologised, but I was too concerned about my knee to respond. I stood and slowly begun to run with a slight limp. Generally a knock like this will ease off after a few minutes. It took a little longer than I expected, but sure enough it slowly eased off. Phew, that was close! During the dog drama, Rob had caught me back up. We were now making our way through Penzance. It was busy in town seeing as it was Friday evening, and we had plenty of incredibly clever, humorous comments flung at us from underage teenagers with bottles in their hands. Oh, to be young! Then we went around a corner and there was a fayre! We decided to run right through the middle of it. It was very busy, and we were unsuprisingly getting plenty of confused looks as we threaded our way through the throngs of people. Then suddenly I felt a sharp pain in my ankle on the outside, and I was on the deck. I had not noticed that we had just stood off of a curb and had twisted my ankle. I leapt back up and carried on as though nothing had happened. This hurt quite a bit. I tried to remain positive that within 10 minutes it would ease off and I’d be fine, but I knew deep inside that this felt worse than my normal harmless sprains. Just take it easy and carry on I told myself. Rob hadn’t even seen this so was unaware of the pain I was feeling here. Soon we were thankfully out of Penzance and I could try to calm down a bit and assess the damage. My ankle did start to ease off enough for me to run on it with no limp, but I was still very aware of it. It wasn’t right and I had over 80 miles left! After a prolonged period on tarmac, we were back on the trail. A couple of other guys had caught us and we were running as a foursome with me on the back trying to do my own thing. I leapt over a rock and as I landed on my bad ankle, it just rolled and I fell to the floor again. This time it was agonising. I lay there for a moment holding it, waiting for the waves of pain to ease off enough to stand back up. As I got up and begun very slowly lurching down the trail, I realised that things were most definitely not good. I could barely put any weight on it and if there was any unevenness on the trail I had to stop and get around it. Slowly people begun to catch me a continue into the distance. After a very painful run into the next cp at Lamorna with much soul searching about whether to continue or not, I quickly topped up, grabbed some food a continued. It was now getting dark and instead of my usual habit of not putting my headtorch on till the very last minute, I switched it on to give me the very best chance of getting the best footing. It wasn’t too far on from here that I realised it was over. My ankle hadn’t really eased since the second twist. I stopped and got my mobile out and left a message for Lou, who would be fast asleep now. I doubted very much if there would be any signal where she was but she deserved to know. All I wanted to do now was to get to Lands End where the next cp was. A slow trickle of people were worming there way past me all asking if I was ok. I told them that I was out, but that they needn’t wait. I thought back over the previous events starting with the dogs and couldn’t help but laugh at how disaster prone I had been. Lady luck was most certainly not on my side today! I then got caught with a group of runners who weren’t sure where the path was. I was not really thinking so was happy to follow some chap who had recced this section. We were soon heading inland with no signs of any acorns on the footpath signs for a while. I knew that this wasn’t good, but just hung on at the back, not bothered about losing time as I was finished. Sure enough we were soon on a road then were running through a campsite over a fence and through fields till we eventually were back on the path. I was now alone again. There was a sharp drop into a gully before climbing back up to the Minnack Theatre. It was on this descent that my ankle gave up one last time. This one was bad! The pain was intense and made me shout out as I hit the ground again. The waves of pain were quite incredible this time and took longer to ease enough to stand. As I got up I really struggled to move forward. Up to this point I had pushed the thought of Trans-Europe out of my mind. Now though it shot in there and my spirit dropped. TE was in 8 weeks time. Whatever I had done did not feel like it would be good to run 42 miles a day for 64 days! I remember actually laughing out loud here trying to kid myself that I didn’t mind, that it didn’t scare me. Within minutes two guys caught me up. One being Tobias. He wanted to stay with me to make sure I was safe but I told him to continue. He made sure he had my number and said he would call me in a while to make sure I was safe. When I got to the car park, there was a couple there who were supporting a runner who hadn’t turned up yet. They were amazing! They sat me in the back of their nice warm car with my foot up and fed and watered me. I started down at the offending ankle. It had ballooned considerably. I removed the calf guard and my shoe. After their runner had passed through, they drove me to Lands End and dropped me at the cp. As soon as I walked into the building, the medic there got to work on me. After he had dealt with my ankle he cleaned up my knee from the dog incident and then I was sat waiting for a lift back to the finish. I was told it could be a fair few hours. Also dropped out and waiting here was an Italian called Lorenzo who I had met at Trans-Gran Canaria. He had been nauseous and vomiting though was ok now. we watched the runners coming and going for hours. Lorenzo chatted plenty. He had run the first Tor des Geant which is a race very high up on my to-do-list. He was great company for what could have been a dark time. As I sat there I thought back to the only other time that I had been to Lands End. It was when I completed and won the JOGLE race. What a contrast in emotions this place will forever hold for me. I was very sad to have hardly got going on the race that seemed to mean a great deal to me. I couldn’t even return to have another go next year as Endurancelife were planning to move the course to a different 100 mile section of the SWCP every year. It is now Tuesday and I have had it x-rayed with no signs of a break and tomorrow I see my Doctor to try to convince him that I need an MRI scan to see what soft tissue damage is lurking inside. I have had some fantastic communication from Mark Hines who who just happens to be a exercise physiologist and biomechanist and is giving me some hope that I may be able to make it to the start line of TE. I do understand that there is a very real chance that I may not though and if this happens then I will worry about it then. For the next 8 weeks, all of my energy will be focused on recovery. I just want to thank everyone for all the kind words of support I have had through different means. It really means a lot. I will miss my running over the next 8 weeks, but hopefully I will then be running everyday for 64 days! I will post again with developments good or bad. p.s. I forgot to say. I have decided that I will run this course solo as I really want to see it. I have no idea when I will do this, but I’m sure I will find a spot. Maybe a midwinter 100…? Great post Neil. I am so sorry luck was not on your side this time but sincerely hope that your foot is fixed plenty of time before your trans European run! Great to meet you and all the best!! Hey Mate. Really really hope everything is going to be OK for TE. You don't need to do anything between now and then and you can still smash it. Hope the recovery goes well. Great Post Neil, Sorry it didn't work out for you this time but there is bound to be a silver lining somewhere. You just need to find it! Good luck with the recovery. Great post…You just had no luck! You did well to continue after the dog incident! All the best with your recovery for the TE. Thank everyone for your kind words. It fills me with much positivity and makes me feel lucky to be a part of a special community. hope your ankle is recovery fast. I am looking forward to see you in Skagen. Its steven here,( me and my dad gave you and lorenzo a lift back to watergate bay). Hope your ankle is well on the mend as my right knee certainly is. It was in a bad way though on the sunday as i ended up in A&E. I’d burst the BURSA sack between my tendon and knee. I know how gutted you felt when you realised your race was over, i tried putting of making that oh so dredded call for many a mile myselfe but i had to just be sensible and it was the first time i have ever withdrawn from an event in 26 years of competing. This is the first time i’ve been on your site and its just as inspiring to read as you were to meet. Hope all goes well for the trans- europe. Cheers. Steven.